This is my first question here. I'm a self-taught piano player and playing the piano since 7. I taught myself how to read notes and listened to many mp3s just to get the tempo and beat right for pieces I enjoy playing. Right now I'm working on Claire De Lune by Debussy. However, there are some notes I encountered which showed a flat sign for a note which is already naturally flat(ed) as per its key signature. Key signature says that RE should be flat. Then another flat sign is shown on 1. So, should I play 1 as REb or DO(flatted re twice is do)? How about number 2? Should I play it Sol#-Ti or Sol-Ti? I really love the tune of this piece and I'm now on page 3. 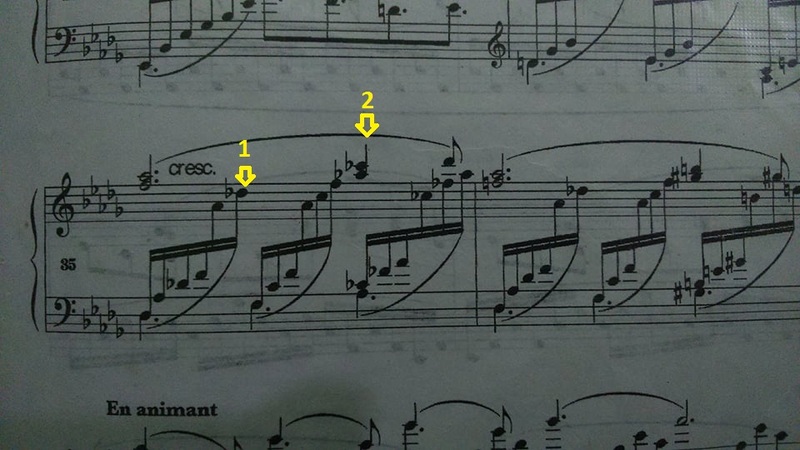 I'd appreciate if you can tell me the right way of reading notes with flats/sharps in key signatures and another on note itself. Anything apart, there's a good chance your ears will tell you the answer. However, a # or b in front of a note that is already marked in the key signature is usually there as a polite reminder that although it may have been cancelled by another accidental in the previous bar, it's now been re-instated. A courtesy accidental. Not needed, as the barline itself will automatically cancel any accidental that was in the previous bar. It certainly won't mean double flat the note in this situation - or any other. If that's needed, a bb will be put there, despite what the key sig. says. Any accidental on a note is absolute, not in reference to the key signature. That way one can place "reminder accidentals" if there already has been the same accidental previously in the measure but some time off, or if there has been a non-key accidental in a previous measure and/or a different octave. Not the answer you're looking for? Browse other questions tagged piano notation sheet-music rhythm or ask your own question. If the time signature changes, does the key signature change as well?